Natalya Stanko is a recent graduate from the Penn State University Schreyer Honors College in journalism. 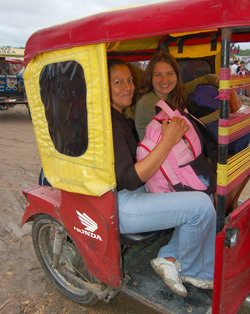 She spent six weeks in Peru during the summer of 2009 as an Amazon Field Volunteer with the Center for Amazon Community Ecology. 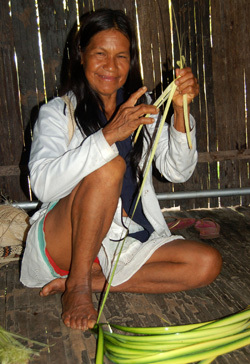 She accompanied Center director Campbell Plowden on visits to Bora and Maijuna native villages, the campesino village of Chino on the Tahuayo River, and the Jenaro Herrera Research Station on the Ucayali River operated by the Institute for Investigations of the Peruvian Amazon (IIAP). She reflected on her time in Peru in the essay below “What makes a journalist.” Also see Natalya’s running account of her experiences at: Report from the Field – Natalya’s Log. 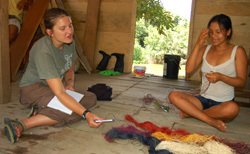 Read more about the Amazon Field Volunteer program. Please contact Campbell Plowden at cplowden@amazonecology.org if you are interested in applying. It was on my last day in Iquitos, Peru that I finally understood what I should have been doing for these last six weeks in the rainforest. When the realization hit me, I was eating yuca and paiche fish with Daniel Valencia, a Peruvian anthropologist working for the Instituto del Bien Comun. I asked Daniel about how he conducted interviews with the indigenous people of the Amazon, and how he introduced their culture to an audience that was largely unaware of the natives’ existence. I was curious, because I had been doing much of the same. This summer I interned in the Peruvian Amazon with Dr. Campbell Plowden, president of the Center for Amazon Community Ecology (CACE), a non-profit organization headquartered in State College. I learned about the Center’s resin research and shared CACE’s discoveries and community projects in my blog. I also interviewed artisans and wrote articles about them for CACE’s online handicrafts store. I had met Daniel in a village along the way, and he asked me to dinner to compare notes. I wanted to make my articles stronger, and I thought Daniel could help me out. That’s why my fork and knife had company this evening: a notepad and pencil. Daniel did not have a notepad. My innards lurched and my brain slammed into my skull. A realization! He was right, and this is what had been gnawing at me all along. All those boat rides, all those faces, all that scrambled Spanish, and I was doing it all wrong. I looked away from Daniel and listened to the city. Motorcycles turned at the intersection in front of the plaza. I counted 23 motorcycles, one car. I laughed and exhaled. I hadn’t done it all wrong! This silence, followed by a sudden break in silence with something as trite as mango juice, was familiar. Daniel could have said so many things to break that silence, but he chose mango juice. And that, as I later learned that night, said a lot about him. I knew this silence. Elvira Pena Saldano had introduced me to this silence. I had arrived at her doorstep exhausted from folding and flipping my tongue in mangled Spanish for three hours with the other village artisans. Instead of asking the usual questions, I watched her weave a handbag out of chambira, a local palm tree. Her 16-year-old daughter, Lisbet, watched me, and I watched Elvira, and Elvira watched her hands. We listened to the rain on the thatched roof. By my United States cultural standards, the silence should have been awkward, but it wasn’t. And then Elvira broke the silence, not with juice, but with an anaconda. In her native Bora tongue, she sang about a snake that transformed into a school of fish. 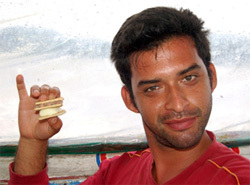 According to Bora legend, these fish cling to other anaconda like lice to hair, explained Elvira’s husband, Sergio. In response, I just nodded. I had asked other Bora what being Bora meant to them. But they never answered, preferring to giggle and talk amongst themselves in Bora. And now, because I didn’t ask, Elvira told me. Elvira grew up here in Brillo Nuevo, a village of about 80 families on a tributary of the Amazon River. It is where she learned to sing in both Bora and Spanish. And where her 11-year-old pet parrot, Maruja, learned both Bora and Spanish. Now, fifty-five years later, life is changing in Brillo Nuevo. Everyone used to know how to sing and dance. The community would have ten or eleven traditional festivals every year, Elvira says. Now they hardly have one. After Lisbet finishes school this year, she wants to move to the city to attend university. Lisbet wants to be a scientist or engineer. She tells me that she is going to learn English, and that she will visit me in the United States. 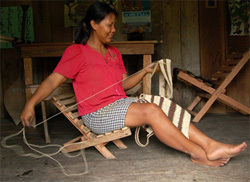 But for now, Lisbet still spends the afternoon with her mom, learning to weave bags out of chambira. Elvira broke the silence with an anaconda, with a Bora legend, with her culture and her daughter’s culture — with what was most important to her. Similarly, Daniel broke the silence with mango juice. Daniel said that he hopes he can always pick a fresh mango. He wants his articles and research about the natives of the Amazon to influence the government to form an area of conservation for the indigenous communities. That way, they, too, can enjoy fresh fruit from healthy forests each morning. In the Amazon, I learned that, when in the Amazon, most questions are stupid questions, and that there’s always time to find out the answers without asking the questions. I learned that a journalist doesn’t always carry a notepad and pencil. And yes, the rainforest has lots of bugs and boats. 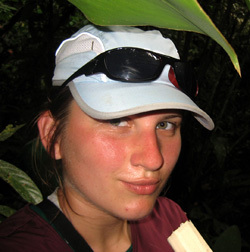 To find out what chiggers look like and how I survived a 27-hour canoe ride, or to learn more about CACE’s research and community projects, visit my blog: Report from the Field – Natalya’s Amazon Log. After graduating, Natalya did an internship with the Sierra Club at their main office in San Francisco. She has now returned to the east coast where she is continuing to pursue her writing career. CACE thanks Penn State’s Schreyer Honors College for its international travel grant that it gave to Natalya and Greg Harriot, another Schreyer student who was the CACE Amazon Field Volunteer in 2008. Read Greg’s essay from that summer “I need this shot” and see current samples of his cinematography reel. Natalya’s essay “What makes a journalist?” can also be downloaded from the CACE website. 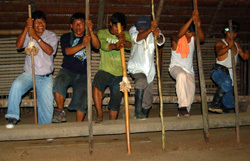 This entry was posted in Amazon Connections - Issue 3 and tagged Amazon, Amazon Connections - Issue 3, Amazon ecology, Amazon Field Volunteer, Bora, Brill Nuevo, Campbell Plowden, Center for Amazon Community Ecology, chamibira, Instituto del Bien Comun, Jenaro Herrera, Maijuna, Natalya Stanko, Peruvian Amazon, Schreyer Honors College. Bookmark the permalink.